It was a beautiful morning today at 7:30AM down on the rocks by the red cottage near my house in Yarmouth. The tide was right (my feet were not getting wet!) and the only sounds I could hear were made by ducks. Awesome! That's Basket Island on the horizon. 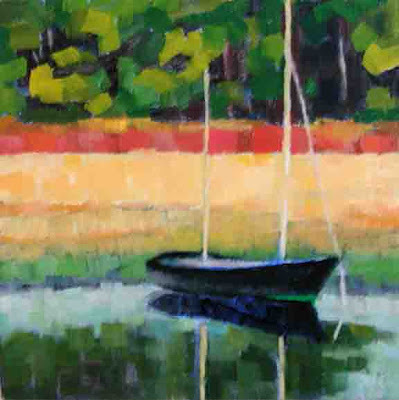 There has been too much rain and too many overcast skies these last few weekends, so I did enjoy painting Casco Bay Reflection (oil 6"x6"). I have spent the weekend starting paintings and then wiping them off. Very frustrating! I don't know if it is due to last weekend's class, changes in schedules, or tackling difficult subjects, but I just can't seem to get what I want. I'm really trying to "paint what I see", but not getting there. 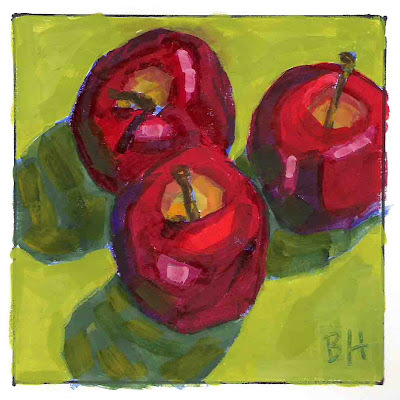 So this morning I went back to something I know, a simple still life in gouache (5"x5"). This one went pretty smoothly and I felt better. I think tomorrow I will tackle a landscape. 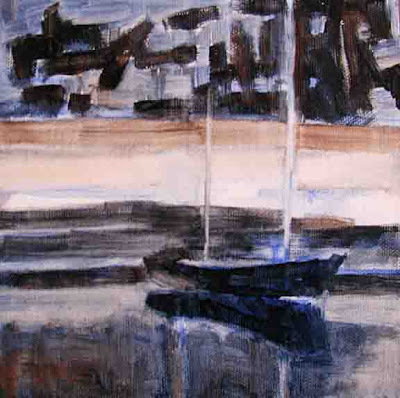 This painting is for sale online at my zatista store. 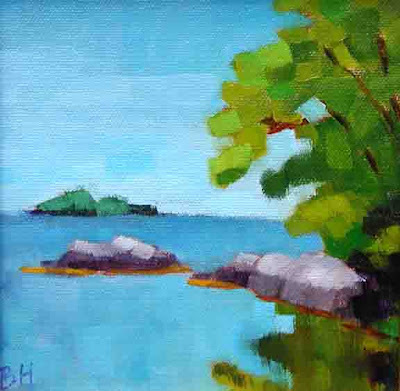 I am doing a solo show at The Gallery at Boothbay Harbor in July. Rick, the gallery owner, is a friend and fellow marine painter. An exciting part of the show is that I will be doing a demo on July 3rd at 3PM, leading into the First Friday gallery tour. I am excited about doing the demo. I often paint outside, even in areas where there are quite a few people, but a demo where I am expected to explain what's going on will be a bit more of a challenge. Rick and I discussed what I should paint, and agreed that a scene which can be displayed on the large computer monitor in the gallery would be best. This marsh scene from (you guessed it!) 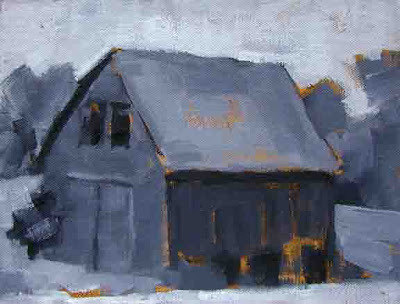 Cove Road in Freeport, is what I have chosen (5"x5" oil). You will likely see it again before July, as I give the demo some dry runs. 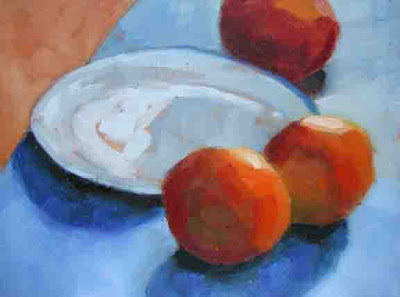 Colin Page Workshop III and "Backlit Oranges"
On our second day we painted inside to avoid the rain. Colin had set up several marvelous still lifes, take a look at his site to see the kind of thing he goes in for; rich fabrics, lots of fruit, flowers, dishes, plates. It was tempting to go for a full view, but I wanted to paint something I could complete during the session to get his advice on the whole process. Colin's demo was of a backlit wine bottle and some apples, which were almost black from his viewpoint. I went for that same kind of view, but of a plate and some oranges he had arranged nearby. The idea was to look very closely at the values and colors, and "paint what you see", not the color you think oranges, or plates, are supposed to be. At one point, I lost the blue in the forground shadows and tablecloth into a muddy mess and had to wipe that part off and try again. It was worth it (8"x6" oil). On Saturday afternoon we painted the barn again, using a limited palette of titanium white, ultramarine blue, cadmium yellow medium, and for most people quinacridone red. 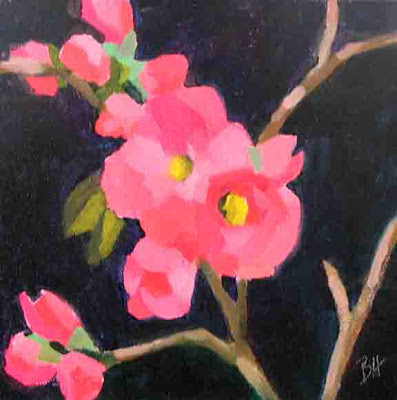 I used phthalo red rose, which is also a red that leans toward blue. Colin wanted us to explore the range of colors that we could make with that palette. The idea was to pay close attention to both the value changes and the color changes in the contiguous shapes. Looking back on it, I think that palette, which cannot make saturated greens, works well on an overcast day. And on that kind of day it is easier to see the values as well as the color. But it could have been warmer! My effort is above (6"x8" oil). Colin Page Workshop I and "Barn Values"
I spent the weekend at an excellent workshop taught by Colin Page and run by River Arts in Damariscotta, ME. I thought it was so good that I am going to spend a few posts on it. This was a plein air class, but the weather was not very cooperative, with no sunshine and cold temperatures. We did the first day outside and the second in the River Arts building, which is a charming antique building and very comfortable. There were four assignments during the two days and Colin did wonderful demos for each one. He paints very quickly and with assurance, and even at this pace gave a clear description of his method. 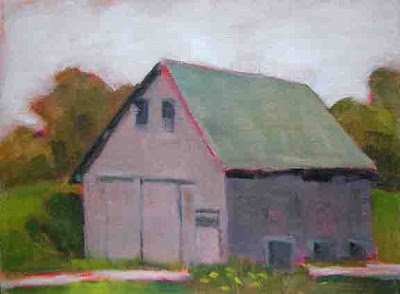 The first assignment was to paint a value sketch of the barn across the road from the Great Salt Bay Farm in Damariscotta (I will definitely be going back there!). Colin gave us toned canvas panels, and helped us to focus on the values in relation to each other. 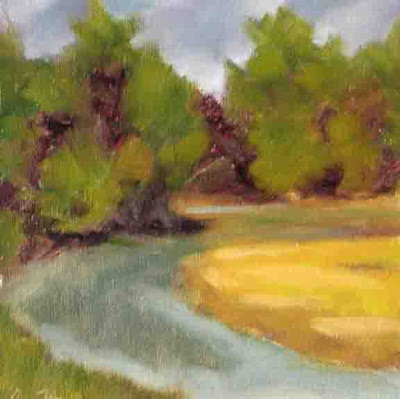 My effort is above (6"x8" oil). Here we are, back a Cove Road in Freeport. Such a wonderful place to paint! This lovely ketch hides around the corner, only visible behind the marsh grass at high tide. I thought I would show the value sketch (bottom) as well as the finished painting. The sketch, done yesterday, was pretty dry by the time I came back this morning to add the color. 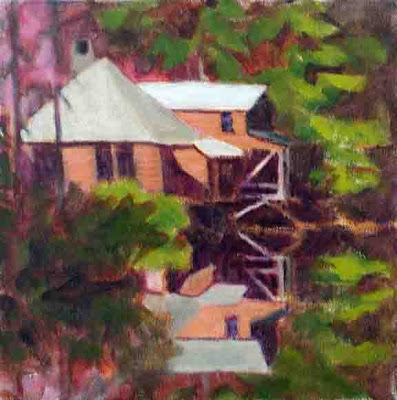 "Cove Road Ketch" is a 6"x6" oil. I painted today with my friends Suzanne and Martha, who clipped a few branches from the quince bush outside the door for us to paint. They were just too gorgeous to resist. Martha took a still life approach but I wanted more of a close-up. They laughed at me as I peered through my square view finder at an angle and tilted the easel side ways to get the composition that I wanted. (This was only in the layout phase!). I tinted the canvas with wiped-off Thalo Red Rose, and painted the flowers and buds first to get clean saturated colors, then the branches and the greenery. Finally I reshaped them all with the background (6"x6" oil). There is a small red cottage near our house that has the most wonderful lupine field. 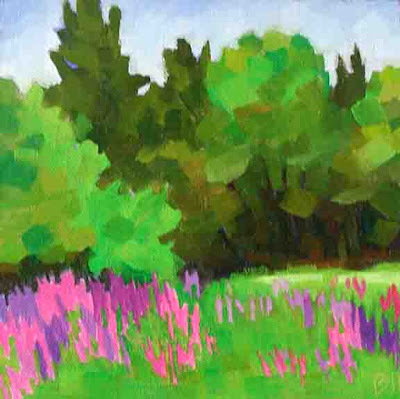 I am anticipating a bit with this painting (6"X6" oil), since the lupines are not out yet this spring. I am looking forward to that. Done with a flat brush as opposed to the filbert that I usually use. The Maine Audubon Borestone Show opened tonight in Falmouth. I have been sick this last week with the flu, and was happy to be well enough to attend. This painting (8"X8" oil) is the one I did on sight at Borestone last September, and I used it as reference for the larger piece that I donated to the show. I felt this one was too brown and that the reflection was hard to understand, both of which I corrected in the later version. It was tremendous fun painting this one!